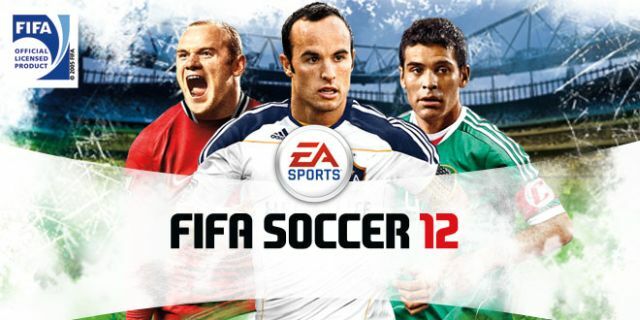 FIFA 12 comes out this Friday, so it’s time to start thinking about which soccer game you’ll be investing in this season. That means only one thing – it’s time for our annual post comparing FIFA with Pro Evolution Soccer! Since PES 2012 isn’t released until October 14 in some places, the temptation will be to splash out on EA’s title this week and not bother with Pro Evo, or just to stick it on your holiday gift list. But what if EA has tweaked the excellent FIFA 11 too much and ruined it? What if PES 2012 makes the leap and recaptures the magic of those enchanting previous generation versions? Pro Evo has been accused of losing its way in recent versions – a pal of mine now calls it “No Evo”! It’s fair to say that PES has struggled to make the jump to the next generation of consoles, while FIFA positively embraced the new possibilities. PES 2012, however, as with the previous version, sees the magic of the glory days (I’m talking Pro Evo 3 through to 7) slowly returning. PES 2012 is fast, fluid and fun to play. The game engine gives you a real sense of freedom: there are always plenty of options when attacking, passes can be weighted to perfection, and shooting is a joy to behold. Pro Evo 2012 adds a new off-the-ball control system, which allows you to unlock even more new attacking opportunities. A run down the wing is now a journey into a world of possibilities, as you can take control of any other attacker, drifting into space to receive a pass or pulling a defender out of position to create space for the player on the ball. Granted, controlling players off the ball (done using the second analog stick) is disorientating at first, but you’ll soon start to love it. The AI in PES 2012 has been tweaked a bit too, and you’ll find that teammates move more usefully than before (overlapping full-backs, for example). However, work still needs to be done on the defending – the defensive third often resembles a school playground, with all the players gravitating towards the ball at once. Unfortunately, the goalkeeper AI is still terrible too, and they continue to make atrociously bad judgments at times. There’s no doubt that the new version of Pro Evo is fun to play, but there are elements that frustrate, most notably in defense, where it often feels like you have very little control or precision. This is something that this year’s FIFA has worked hard at, and it shows. While Pro Evo has gone from realistic simulation to fun, playful, pick-up-and-play game, over the last few releases EA’s soccer title has made the transition the other way, going from arcade kickabout to serious soccer simulation. Back in the day, FIFA felt very rigid and restricted. There were only so many ways you could cross, head, shoot, tackle and pass. Movement was limited to eight directions, and while the FIFA of old could be fun, it lacked the realism many serious soccer fans crave. These days, FIFA is a different beast. Thanks to 360 degree movement, more passing controls, and a dizzying array of shot types, FIFA 12 has a sense of openness about it that was lacking before. It’s still not perfect, and your attacking options in the final third can feel a bit limited in comparison with PES, especially since the introduction of those off-the-ball controls that we talked about. But it’s in defense where EA has made a big leap in version 12. Gone is the ability to just pressure the ball off the opposition by holding down one button. 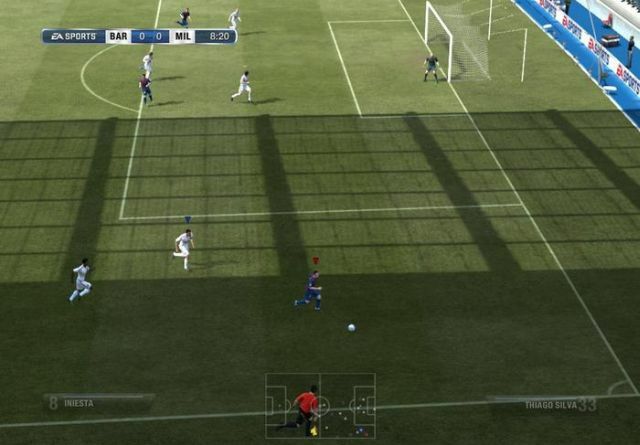 The new tactical defending system in FIFA 12 means there’s now much more thought and skill involved in robbing the ball from an opponent. Manual tackling means timing is everything, and if you press the button too early or too late you can be in real trouble. It takes a lot to get used to this way of getting the ball and I have to admit it’s annoying at first. I found it strange as well that there is one type of close quarter tackle, which just involves sticking your leg out to get the ball. It feels a bit unrealistic that other kinds of block tackles can’t be made. Luckily, this fiddly new tackling system is backed up by other defensive techniques, including slide tackles, jockeying, calling for a second defender, and even the ability to tug the attacker’s shirt or give him a little shove to try and knock him off his stride. If you can get through that awkward first encounter with the new defensive controls, you’ll find that FIFA 12 is even more of a treat to play than last year’s edition. PES 2012 is quite hit and miss in its presentation. The stadium environments are impressive, and the lighting system used out on the pitch is exquisite, especially when you play floodlit matches. Opting for a darker tone to FIFA’s overly bright and shiny look makes the pitch environment look more realistic and gives you the impression that you’re really out there with the players. The overall look of PES 2012 is very polished, and has a real televisual feel. From the official Champions League music and idents, to the motion blur in replays, the new PES often tricks you into thinking you’ve accidentally hit the AV button and switched back to TV mode. 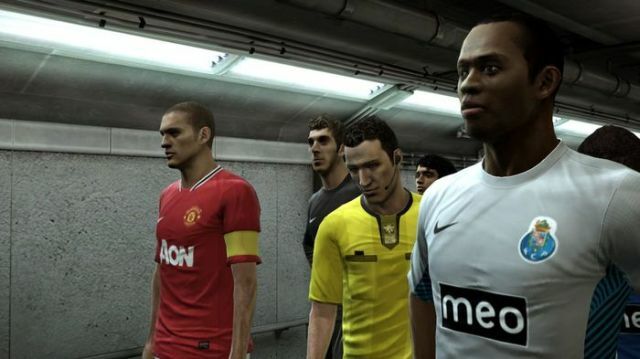 Player likenesses have been improved overall, but in general aren’t as lifelike as those in FIFA 12. Close up, some of the less famous players look like they’ve been molded out of plastic, and facial animation is very rigid. Animation in general in PES 2012 isn’t great. Players’ movements when they run around the pitch feel less natural than in FIFA, and I also noticed some strange ball physics when playing the demo, which is very off-putting. It’s a shame Konami couldn’t quite carry the slick broadcast feel out onto the field of play itself. When you crank up FIFA 12 for the first time you won’t notice much difference in terms of appearance. Sure, player likenesses have had their annual fine-tune, and the camera angle is a bit lower, but the overall changes to the look are very subtle. Once you start playing though, you’ll realize that FIFA 12 has made big strides when it comes to animation and game physics – an area where PES falls down. There’s an overall feeling of solidity that was lacking a bit from previous FIFAs. This is partly down to the slightly slower running speeds, but mainly owing to the impressive new collision system. 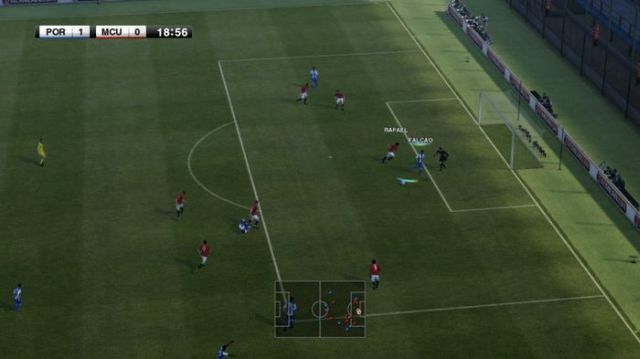 Thanks to a clever new physics-based detection system, FIFA 12’s players now react in a much more realistic way. Instead of just playing out one of a few stock animations as before, players now fall down or stumble differently depending on where and how forcefully impact was made. It really makes for a meatier game, although there are some bugs that EA needs to iron out in an update, as you’ll see from this video. Poor old PES has never had the luxury of a fully-licensed database of teams and players. As a result, its poor team of developers constantly have to think up inventive pseudonyms for real life clubs and footballers. Konami now has the rights to Champions League, so at least the players, team names and kits involved in these competitions this season are included. Also, the Spanish La Liga is now officially licensed with all the real teams, kits and players. If you want the full real life experience, of course, you’ll have to hit the massive Editor section of PES 2012, where you can tweak names, kits, player appearance, and lots more. There are fewer domestic leagues and competitions in PES 2012 than there are in FIFA (you can only choose between English, Spanish, French, Italian, Dutch and Portuguese leagues), although there are significantly more national teams than you’ll find in the EA version. FIFA 12 will top PES 2012 in this category all the time, simply because EA has the weight of soccer’s governing body behind it. As a result, you get to play in more than 30 different officially-licensed leagues all around the world, including all these countries’ cup competitions. The only thing FIFA misses out to PES on is the Champions League and Europa League rights. 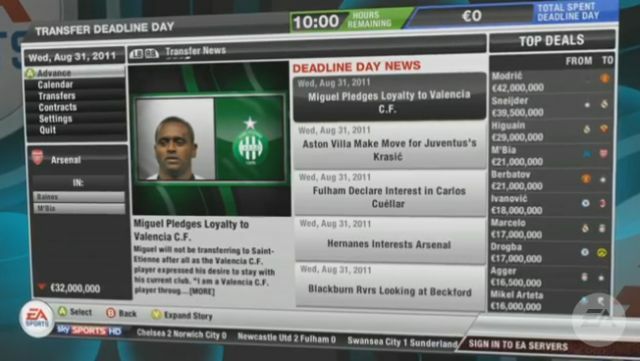 The ability to update player database after the transfer window helps to ensure that squads in FIFA 12 are always in sync with real life. Editing with FIFA’s Creation Center is less powerful than it is in PES 2012, but then, it doesn’t need to be because everything is already present and correct, straight out of the box. 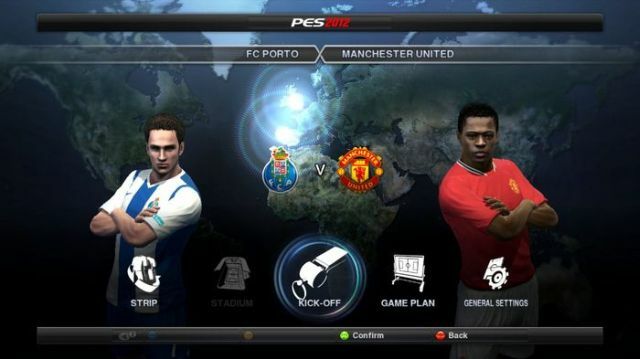 There have been some new additions and a few tweaks to the existing game modes in PES 2012. Club Boss is a new section, in which you get to become owner of a club and attempt to bankroll them to victory. Although it doesn’t allow you to participate in matches like you do in Master League, it’s an interesting new aspect to PES. Speaking of Master League, things have changed a bit here too. The presentation has been overhauled and it’s now dominated by regular video cut scenes showing your signings to the press, giving team talks, speaking with your secretary and the like. Although this may get tedious after a while, it does help to add a new dimension to PES’ career mode. Good news for fans of the Training Challenge feature in Pro Evos of old – it’s back. Once again, you can test your skills in certain areas of the game by competing in score and time-based challenges. In terms of online play, PES 2012 brings with it a few tweaks designed to lift it somewhere close to FIFA’s elevated status in this department. New additions include eight-player online matches, a more realistic online Master League, Facebook integration, and better matchmaking with opponents for fairer online matches. For me, FIFA’s Career mode has never quite had the charm of Pro Evo’s Master League. While the hub of the career mode largely remains unchanged, there have been a few welcome tweaks to the format. Players now ask to be rested, for example, or they can become unhappy at not being played and demand a transfer. Youth players develop much faster, and a scouting system has been added for finding new talent for your team. Transfer deadline day is now more exciting, thanks to the inclusion of an hour-by-hour countdown timer when you get to this date. 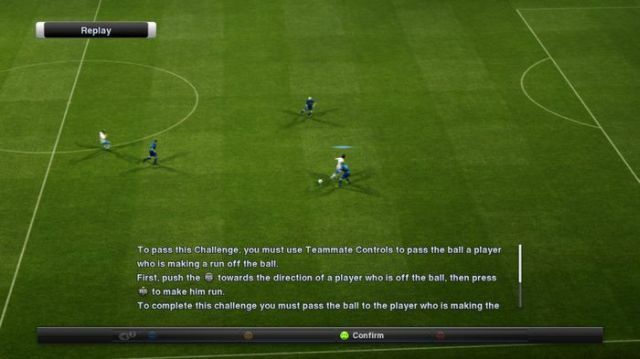 You can still play as a manager or Be a Pro in FIFA 12, although these modes are pretty much lifted from version 11. New game modes in FIFA 12 include the EA Sports Football Club, which is kind of a social network for FIFA fans. When you first start the game you’re asked for your favorite real life team. Then, everything you achieve in FIFA will earn points for that club (regardless of whether you’re actually playing as that club). Average scores from each supporter of each club are calculated to create a real life league of FIFA players, which is fun to follow. Other notable changes include bundling the previously paid-for Ultimate Team section for free, as well as a new head-to-head online league where you play 10 games in season and are promoted or relegated, depending on how you get on. I’ll always be a PES fanboy at heart, but it’s getting harder and harder argue the case against FIFA. EA’s title is a real work of art and a worthy testament to a painstaking development process. FIFA 12 is ultra-realistic in terms of looks and the way the game is played out. Thanks to improvements in the intelligence, physics and personality of the game, no longer do you get two matches, goals, or even fouls, the same in FIFA. Predictability used to be one of my major complaints about FIFA, but it’s no longer a problem. If FIFA has evolved into the sim king, Pro Evo is now very much the more fun, approachable member of the soccer gaming royal family. PES 2012 presents an enjoyable match, even though it’s a bit shaggy round the edges. FIFA 12 is the better football game for sure, but this doesn’t mean that PES 2012 is terrible. My advice – get FIFA now, and ring in the New Year with PES!